The Zoom Buggy® electric utility cart makes it easier than ever to bring all your gear over sand, grass, gravel or other difficult surfaces. With its powerful motor it goes over stairs, as well as variable speed control, forward and reverse. This motorized utility cart can easily maneuver large, heavy, awkward gear over most terrains and its wide wheels will not sink or plow on sand. 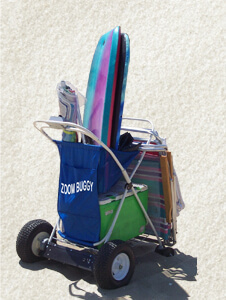 The Zoom Buggy®. is a heavy duty all terrain folding cart that can carry up to 100 lbs. It easily fits several folding chairs, umbrella, a large cooler, plus all your beach gear. It also includes a nylon bag. So lightweight anyone can use it. Large Carrying Capacity – Holds 100 lbs.